Arsenic (As) is a natural metalloid, widely used in anthropogenic activities, that can exist in different oxidation states. Throughout the world, there are several environments contaminated with high amounts of arsenic where many organisms can survive. The most stable arsenical species are arsenate and arsenite that can be subject to chemically and microbiologically oxidation, reduction and methylation reactions. Organisms surviving in arsenic contaminated environments can have a diversity of mechanisms to resist to the harmful effects of arsenical compounds. The highly metal resistant Ochrobactrum tritici SCII24 was able to grow in media with arsenite (50 mM), arsenate (up to 200 mM) and antimonite (10 mM). This strain contains two arsenic and antimony resistance operons (ars 1 and ars 2), which were cloned and sequenced. Sequence analysis indicated that ars 1 operon contains five genes encoding the following proteins: ArsR, ArsD, ArsA, CBS-domain-containing protein and ArsB. The ars 2 operon is composed of six genes that encode two other ArsR, two ArsC (belonging to different families of arsenate reductases), one ACR3 and one ArsH-like protein. The involvement of ars operons in arsenic resistance was confirmed by cloning both of them in an Escherichia coli ars-mutant. The ars 1 operon conferred resistance to arsenite and antimonite on E. coli cells, whereas the ars 2 operon was also responsible for resistance to arsenite and arsenate. Although arsH was not required for arsenate resistance, this gene seems to be important to confer high levels of arsenite resistance. None of ars 1 genes were detected in the other type strains of genus Ochrobactrum, but sequences homologous with ars 2 operon were identified in some strains. A new strategy for bacterial arsenic resistance is described in this work. Two operons involved in arsenic resistance, one giving resistance to arsenite and antimonite and the other giving resistance to arsenate were found in the same bacterial strain. Arsenicals generated from natural and man-made sources are widely distributed contaminants of freshwater, groundwater and seawater. The biological availability and physiological and toxicological effects of arsenic depend on its chemical form and oxidation state; the organic forms are the less toxic. Among inorganic forms, arsenite [As(III)] is reported to be on average 100 times more toxic than the less mobile arsenate [As(V)] for most biological systems . However, the toxicity of arsenic to organisms also depends on both endogenous factors (e.g. the membrane oxyanion uptake and efflux pumps) and exogenous factors (e.g. mobility of arsenic forms) . There are many environments containing high amounts of arsenic. However, many organisms can survive in such sites, including bacteria, fungi, algae and plants. These organisms have developed mechanisms for arsenic resistance. These mechanisms can include arsenite oxidation (aox genes), respiratory arsenate reduction (arr gene) or arsenic resistance by arsenite extrusion (ars gene) for cytoplasm defence. Arsenic resistance (ars) genes are found in several microorganisms gram-positive and gram-negative and are located either in the chromosome or in the plasmid. Most ars operons consist of three genes: arsR, arsB and arsC, and most of the knowledge about these genes comes from studies of ars operons in Escherichia coli , Pseudomonas aeruginosa  and Staphylococcus species [5, 6]. Some ars operons such as those carried by E. coli plasmids R773  and R46  and Acidiphilium multivorum plasmid pKW301  have five genes arsRDABC. The arsR gene encodes a regulatory protein  that control the levels of ars operon expression, while arsD gene encodes for a protein first identified as a regulator  and recently reported as a metallochaperone for the arsenic that enhances resistance by delivering this metalloid to the ArsAB efflux pump [12, 13]. The ArsA protein is an arsenite-stimulated ATPase, which forms a complex with ArsB, the transmembrane arsenite efflux pump . ArsC is an arsenate reductase which reduces arsenate to arsenite that can then be pumped out of the cell [15, 16]. The second family of arsenite carriers has been much less characterized and includes the arsB gene of Bacillus subtilis  and the Acr 3 gene from Saccharomyces cerevisiae . Another gene, arsH, without a clear function described, has been found close to arsenic resistance genes in Yersinia enterocolitica , in Acidothiobacillus ferroxidans , in Serratia marcescens , in Synechocystis sp. , Sinorhizobium meliloti [23, 24] and Shigella flexneri . In addition to the above mentioned arsenic resistance operons, a broad diversity of ars operons have been described in different species [26–31]. Species belonging to the genus Ochrobactrum have been isolated from clinical and from environmental samples. Ochrobactrum tritici SCII24 was isolated from soil by Lebuhn et al. however, either its oxyanion resistance or its genetic characterization were not reported. In this paper, we studied the ability of this strain to resist arsenic and antinomy species, and we report the identification of the genes involved in arsenic resistance in O. tritici. We also describe the expression of the ars genes in E. coli AW3110 and discuss the function of each ars gene. Tolerance to arsenite, arsenate and antimonite were tested in O. tritici SCII24. This strain was able to grow in presence of As(III) up to 50 mM or up to 10 mM Sb(III), and also demonstrated high arsenate resistance, growing at concentrations higher than 200 mM (solubility level of arsenate in this medium). A fragment carrying the arsB gene and another fragment containing the arsC gene were cloned from a gene library, and the sequences of these two gene clusters were determined using specific oligonucleotide primers. Five potential open reading frames (ORFs) were identified in operon ars 1 and six ORFs were found in operon ars 2 (Fig. 1). The characteristics of the predicted products of these ORFs are shown in Table 1. Based on the BLAST analysis, the first cluster is composed by four ORFs, which encode proteins that belong to families of well-known proteins involved in arsenic resistance, ArsR, ArsD, ArsA, ArsB and an additional gene coding for a CBS domain (Cystathionine-β-Synthase), usually not related with arsenic resistance. ORF1 (arsR1) encodes an arsenite regulatory protein (ArsR) with 109 aminoacids and shows clear homologies to ArsR proteins from different organisms. The ArsR1 from O. tritici has two cysteines (Cys42 and Cys45) instead of the typical highly conserved putative helix-turn-helix DNA binding motif (ELCVCDLC) well identified in plasmid R773 of E. coli (Fig. 2A). Shi et al. indicated that arsenite only interact with two cysteines of this motif, therefore the presence of 2 cysteines should be enough for arsenic interaction and conformational change of the protein. The second gene, arsD encodes a protein of 124 amino acids, which is homologous of the ArsD proteins recently reported as metallochaperone [11, 12]. Like others ArsD, this protein also has two pairs of vicinal cysteines, Cys12–Cys13 and Cys112–Cys113, normally involved in inducer binding. The next gene of the group, arsA comprises 582 aminoacids, and was described as encoding an ars anion-translocating ATPase (ArsA). ArsA consists of two homologous halves, N-and C-terminal domains connected by a short linker sequence. Each domain contains a consensus sequence (GKGGVGKT) for ATP binding and a metalloid binding domain (Cys113, Cys172, Cys422, His148, His451 and Ser420), in agreement with what it was observed for ArsA proteins of other organisms. The next ORF encodes a 175 aa protein with identity to CBS-binding domains of several families of proteins. The last gene of this cluster (arsB) encodes a putative arsenite efflux transporter ArsB, with 430 aminoacids. Genetic organization of the two arsenic resistance clusters in strain O. tritici SCII24. Gene orientations are shown by arrows. Within the predicted structure of the promoters, the -35, -10 regions and ribosome binding sites (RBS) are boldfaced and ATG codons are in boxes. 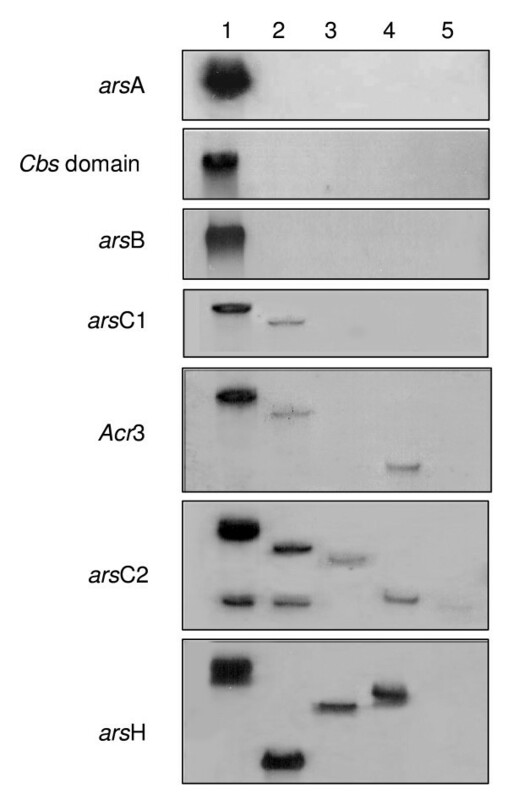 Alignment of ArsR (A) and ArsC (B) proteins. The three ArsR sequences from O. tritici were aligned with ArsR of E. coli pR773 (P15905). Both ArsCs from O. tritici were aligned with ArsC homologues from E. coli pR773 (AAA21096) and Staphylococcus aureus pI258 (AAA25638). The multiple alignment was calculated with CLUSTAL W.
Size and putative function of ars genes found in strain O. tritici SCII24T. The identity and similarity values are based on amino acid sequence data. The nucleotide sequence of the second cluster of the ars genes revealed six ORFs that corresponded to arsR2, arsC1, Acr3, arsC2, arsH and arsR3. The first gene of this group encoded a transcriptional regulator belonging to ArsR family without the typical CXCXXC arsenite-binding motif of pR773 ArsR (Fig. 2A). The next gene, arsC1, encoded a predicted protein of 137 aa, which is homologous of the ArsC protein family represented by E. coli pR773 (Fig. 2B), that uses glutathione and glutaredoxin as electron sources. The third gene was a putative arsenite carrier homologous to ACR3 protein and comprises 352 aa. The ORF4 of this cluster was a second arsC gene, encoding a protein (175 aa) with sequence similarity to the thioredoxin-dependent arsenate reductases related to the low molecular weight phosphatase family. In fact, this type of arsC comes from evolution of ancient tyrosine phosphatase protein. Downstream of the arsC2 gene was found a homologous of a gene previously identified as arsH. This gene was recently identified in a few ars operons, although its function remains unclear. Recently, published work demonstrates that ArsH protein is an atypical flavodoxin with a non-canonical FMN binding site that catalyzes oxidation of NADPH, generating H2O2 and with a low azoreductase activity [24, 25]. The last ORF also showed similarity with a family of arsenic regulatory proteins and therefore it was named arsR3. Unlike all the other genes this protein is divergently transcribed. Alignments of the three different ArsR proteins (ArsR1, ArsR2 and ArsR3) revealed that ArsR2 was more similar to ArsR3 (36% identity and 55% similarity) than to ArsR1 (33% identity and 48% similarity). However, no significant similarity was found between ArsR1 and ArsR3 or between ArsC1 and ArsC2 proteins. "Neural Network Promoter Prediction"  was used to predict the location of the putative ars promoters. In ars 1 operon one motif, predicted as a promoter, was identified upstream of arsR1 gene. As shown in Fig. 1, the putative -10 region (TATTAT) was separated from the -35 region (TTGCCA) by 17 nucleotides. In ars 2 operon, two motives estimated as putative promoters were found upstream and downstream of arsR2 and arsR3 genes, respectively. In this case, we also identified the putatives -10 (TATATA and TATCCT) and -35 (TTATCA and TTGTCG) promoter boxes separated by 17 nucleotides. 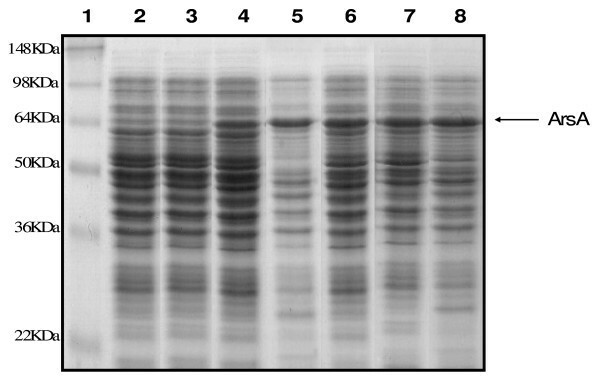 Before investigating the role of O. tritici ars genes in arsenic resistance, we examined which polypeptides were expressed in E. coli by using a polyacrylamide gel. When the transformant carrying the complete ars 1 operon was cultivated in the presence of arsenite or antimonite, only one additional polypeptide was produced in large amount (Fig. 3). This protein identified by comparison as ArsA, had approximately 63 KDa that was consistent with the size predicted from the aminoacid sequence (62.6 KDa). Expression of the O. tritici ars genes in E. coli AW3110 under control of ptrc promoter. The gel used was a SDS-12% polyacrylamide gel. Lane1, marker proteins, lane2, plasmid pTRC 99A without an insert; lanes 3, 4 and 5, construct parsRDAcbsB in absence of any oxyanion, in presence of 1 mM As(III) and 1 mM Sb(III), respectively; lanes 6, 7 and 8, construct parsDAcbsB without any oxyanion, in presence of 1 mM As(III) and 1 mM Sb(III), respectively. However, this protein was not found when the same clone was grown in the absence of arsenite or antimonite. Furthermore, all different clones without arsR1 gene cultivated in the presence or absence of these chemicals were always able to produce this ArsA protein, indicating that ArsR worked as a repressor protein in E. coli. In contrast, all of the others ars products (ArsR1, ArsD, CBS domain, ArsB, ArsR2, ArsC1, ACR3, ArsC2, ArsH and ArsR3) were not found in the total proteins of E. coli. Different constructs of the ars genes were used to evaluate the role of these genes in arsenic resistance in E. coli AW3110. All experiments were done in the presence of 0.5 mM IPTG as inducer and the cultures were analyzed for their ability to grow on increasing concentrations of arsenite, arsenate and antimonite (Fig. 4). Cells carrying the constructs from ars 1 operon parsRDAcbsB, parsDAcbsB, parsAcbsB and parscbsB showed equivalent levels of resistance to As(III) (Fig. 4A). On the other hand, resistance to arsenite was not found in cells carrying the empty vector, or containing the constructs with each of the following genes: arsA (parsA), arsB (parsB), cbs (pcbs), arsA and cbs (parsAcbs). Growth of E. coli AW3110 containing different constructs in the presence of arsenite (A and B), arsenate (C) and antimonite (D). Arsenite and antimonite resistance assays were performed in LB medium and arsenate growths were performed in low-phosphate medium. Each data point represents the results of three independent assays. The error bars indicate standard deviations. O.D. 600 nm, optical density at 600 nm. The experiments related to arsenite resistance by ars 2 operon, showed that this second operon also conferred As(III) resistance to E. coli cells, but at a lower level than the resistance conferred by operon ars 1. Comparing the different constructs of ars 2 operon (Fig. 4B), the clone with all genes (parsR2C1Acr3C2HR3) showed the highest As(III) resistance. Cells carrying the constructs parsR2C1Acr3C2H, parsAcr3C2HR3 and parsAcr3C2H showed equivalent levels of resistance to As(III). The constructs parsAcr3C2 and parsAcr3 conferred similar resistance, although at a lower level than the previous constructs and this was more evident for high As(III) concentrations. When the experiments were conducted in the presence of arsenate, we observed that only the cloned ars2 genes increased the level of resistance of the host strain. 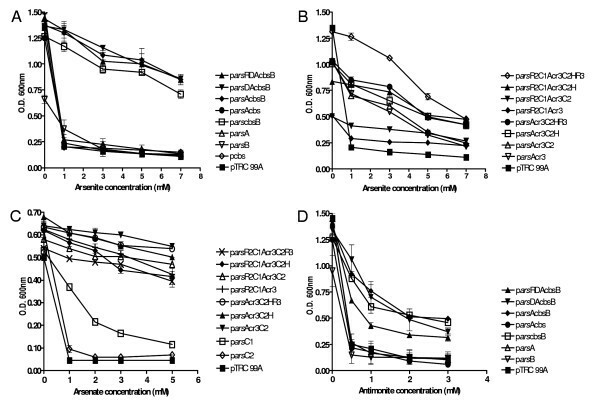 Therefore, abilities of parsR2C1Acr3C2HR3 and subclones to confer resistance to arsenate were tested (Fig. 4C). All the combinations of the multiple ars genes tested conferred similar levels of resistance to As(V). Constructs containing the individual genes did not confer resistance to the host strain except for cells that expressed the arsC gene, which showed a slight resistance to this oxyanion. These experiments are in agreement with the notion that arsC s encode for arsenate reductases, involved in As(V) detoxification. The ars 1 operon was also responsible for antimony resistance, but the ars 2 operon was not able to confer resistance to this oxyanion. The figure 4D shows that clones, parsDAcbsB, parsAcbsB and parscbsB conferred Sb(III) resistance to E. coli cells, as well as the construct parsRDAcbsB although at an intermediary level. Clone carrying only arsB grew less than the wild type in the absence of metal and was not resistant to arsenite. One possibility is the toxicity of the ArsB protein in E. coli  since in the absence of IPTG, clone carrying only parsB grew as well as the will type (data not shown). On the other hand, parscbsB did not induce toxicity in E. coli and clone was arsenite resistant. It is possible that the co-transcription of CBS is required for a correct function of ArsB. The cbs gene encodes a protein with a CBS domain that probably dimerizes to form a stable globular structure with ArsB . RT-PCR was used to test if each ars gene cluster forms a unique transcriptional unit. RT-PCR products related to all ars 1 genes were obtained showing that genes were transcribed from one independent mRNA (Fig. 5). The RT-PCR experiments for ars 2 also showed products for all genes demonstrating that all genes were transcribed from the same operon (data not shown). RT-PCR analysis of ars 1 genes of O. tritici SCII24. Total RNA isolated from O. tritici cells in the exponential phase was used as template in a reverse transcriptase reaction using the reverse primer from arsB to generate cDNA. Then, the several intergenic regions were amplified: arsR-arsD (ane1), arsD-arsA (lane2), arsD-cbs (lane3) and cbs-arsB (lane 4). Specific probes for structural ars genes (arsA, cbs domain, arsB, arsC1, Acr3, arsC2 and arsH) were designed to determine the presence of the ars genes in other strains belonging to the genus Ochrobactrum. Total DNA from these strains was analyzed by Southern blot (Fig. 6). The genes arsA, arsB and the gene coding for the CBS domain were only detected in strain O. tritici SCII24 and the arsC1 gene was detected in both strains of O. tritici (SCII24 and 5bvl1). Using the Acr3 probe a hybridization signal was obtained from preparations of O. tritici (SCII24 and 5bvl1) and type strain O. anthropi. Southern blot experiments performed with arsC2 and arsH probes yielded a signal for all of the Ochrobactrum strains tested except for type strain O. intermedium. The ability of strain O. tritici to resist up to 50 mM As(III), 10 mM Sb(III) and more than 200 mM As(V), turns this bacterium into one of the most resistant microorganisms described to date, most probably due to the presence of two functional ars operons (ars 1 and ars 2) even if the presence of other mechanisms in the cell, participating in arsenic resistance, can not be overruled. The ars 1 operon conferred resistance to arsenite and antimonite and ars 2 was responsible for resistance to arsenite and arsenate. Therefore, O. tritici is the first bacteria characterized which contains 2 operons involved in arsenic resistance each one conferring resistance to different metals or metal states. Although, several arrangements of arsenical resistance operons are possible in Bacteria, usually the genes that confer resistance to As(III) and As(V) are present in the same operon [reviewed in [15, 16, 36]]. In O. tritici the ars operons showed an unusual genetic composition. The organization of ars 1 operon displayed some similarities with the well-known ars operon on the plasmid pR773  and pR46 of E. coli , including the genes arsR, arsD, arsA and arsB. However, the arsC gene (arsenate reductase) was not identified in the O. tritici ars 1 operon. A second atypical feature was the presence of one additional ORF usually not associated with ars genes, which codes a protein with a CBS domain. CBS domains are small domains of unknown function, which were only reported on ars genes cluster of Acidithiobacillus caldus present on a Tn21-like transposon  and on transposon, TnLfArs of Leptospirillum ferriphilum . The ars 2 operon of O. tritici could be also differentiated from previously described ars operons. One of the differences was the presence of two arsR genes with opposite orientations. While arsR2 gene was located upstream with the same orientation as arsC1Acr3C2H, the arsR3 was located downstream and was divergently transcribed. Another intriguing characteristic was the presence of two arsenate reductase genes, arsC1 and arsC2, encoding distinct ArsC protein families. The ArsC1 belong to the family represented by the E. coli pR773 ArsC that uses glutathione and glutaredoxin as electron sources . In contrast, the ArsC2 belong to the family represented by the S. aureus pI258 ArsC that uses thioredoxin as an electron source . The arsR is commonly found in ars operons and its regulatory function, towards the basal operon expression, has been demonstrated [5, 9, 30]. For most of these trans-acting ArsR regulatory proteins, even with proteins with low homology, the consensus sequence for metal binding (ELC32VC34DLC37) was found. However, the three ArsRs from O. tritici had a very low or even no homology between them and they did not show the typical arsenite-binding motif (Fig. 2). The absence of conserved metal binding box was also previously identified in Corynebacterium glutamicum  and in Acidithiobacillus ferroxidans . In the case of A. ferroxidans, Qin et al. proved the involvement of a vicinal cysteine pair, Cys95, Cys96 and a third residue Cys102, in the transcriptional regulation by trivalent metalloids. In O. tritici, it was apparent that ArsR1 could function as a repressor since the expression of the arsA gene (visible from SDS polyacrylamide gel) depended on the presence of the inducer. The most probable regulatory role of the remaining arsR s genes could not be evaluated, because the ars 2 operon products were not detected by polyacrylamide gel. The arsD, together with the arsR, has been associated to the control of the maximal level of ars operon expression preventing the overexpression of ArsB , which is toxic in excess. Our results also illustrate the toxic effect of ArsB, since the overproduction of this arsenite efflux pump (ArsB) had a deleterious effect on E. coli cells. The experimental data of this work do not support the regulatory function of the ArsD over ArsB expression, since E. coli cells that did not carry the arsD gene (constructs parsAcbsB and parscbsB) showed similar resistance as the constructs with arsD, although the role of metallochaperone-mediator can not be excluded. The arsB gene product could not be detected in E. coli by SDS-PAGE as was previously reported by other authors . Nevertheless, in contrast to other operons [4, 41], the O. tritici arsB gene alone was not able to confer resistance to arsenite and antimony. However, the presence of the CBS domain in addition to arsB gene was enough to increase the resistance to these metalloids. CBS domains are found in a wide range of other unrelated proteins and in some of them a regulatory role of the protein structure has been suggested . Therefore, in O. tritici it is possible that the protein with identity to CBS-binding domain may play a role as a structure decreasing the toxicity of the ArsB. As we mentioned before the ars 2 operon also conferred resistance to As(III), although the ars 2 operon was the only one responsible for arsenate detoxification. A second arsenite efflux pump was located in the ars 2 operon, but, differently from arsB, this one was phylogenetically near to arsenite transporter familly-ACR3, represented by Saccharomyces cerevisiae . O. tritici ACR3 protein as well as yeast Acr3p catalyzes extrusion of arsenite from the cells conferring arsenite but not antimonite resistance. As expected, ACR3 was not homologous to the ArsB found in operon ars 1, even though they both function as arsenite efflux pumps. Arsenate resistance in O. tritici could involve only one or both arsC genes to convert As(V) to As(III), since we observed that not only the ArsC1 was functional in E. coli, but also the ArsC2 usually related to gram-positive ArsC family. ArsC reductases from different phylogenetic groups were already showed to be functional in E. coli . The arsenite produced was then pumped out from the cells by ACR3 protein. An arsH-like gene was also located in operon ars 2. The gene arsH was first described as a regulator  but no specific role could be conferred to arsH in A. ferroxidans  and in plasmid R478 of S. marcescens . Recently, in Sinorhizobium meliloti  and in Shigella flexneri , ArsH was described as a H2O2-forming NADPH:FMN oxidoreductase that also reduces azo dyes. O. tritici arsH gene did not have any effect in arsenate resistance and was not fundamental to arsenite resistance, however, the removal of this gene resulted in a reduction of arsenite resistance by E. coli cells in the presence of high levels of As(III). Therefore, a similar role to that proposed for the Sinorhizobium ArsH can be expected since homology studies of ArsH from O. tritici showed that the protein belongs to the same NADPH-dependent FMN reductase family. Southern blotting did not reveal ars 1-homologous sequences in the other type strains of the genus Ochrobactrum, but signed the presence of the ars 2 genes in some of these bacteria. It is interesting to note the concurrent absence of the first cluster of genes along with strain-sensitivity to As(III) and Sb(III), suggesting the involvement of ars 1 operon in detoxification of both oxyanions in these strains. In contrast, the detection in Ochrobactrum strains of genes from ars 2 operon along with arsenate resistance may reflect the relation between the presence of ars 2 genes and arsenate resistance. 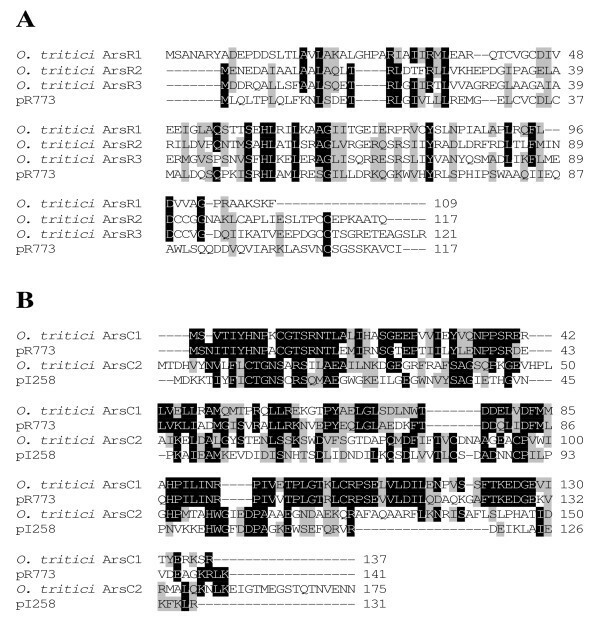 This work illustrates the presence of operons ars 1 and ars 2 in O. tritici and its possible involvement in arsenic resistance showed by E. coli heterologous complementation analysis. Operon ars 1 seems to code for the main arsenite detoxification system and is entirely responsible for antimonite resistance in this strain. Operon ars 2 encodes a group of different proteins with the arsenate detoxification as main function, and additionally is involved in arsenite resistance. This operon includes genes coding for arsenate reductases with different phylogenetic origins. The strains and plasmids used in this study are listed in Table 2. E. coli XL1-Blue and E. coli AW3110 were used as hosts for the cloning vectors or expression vectors. E. coli was grown in LB medium containing, per litre, 10 g of tryptone, 5 g of yeast extract, and 5 g of NaCl. Ampicillin (100 μg/ml) and isopropyl-thio-ß-D-galactoside (IPTG) (0.5 mM) was added to the medium, as required. For some experiments, cells were grown in a low-phosphate medium. This medium contains in g/l, Tris 6.06 (pH 7.0), NaCl 4.68, KCl 1.49, NH4Cl 1.07, Na2SO4 0.43, MgCl2.6H2O 0.2, CaCl2.2H2O 0.03, Na2HPO4.12H2O 0.23 and glucose 5.0. Analytical-grade salts of NaAsO2, KH2AsO4 and C4H4KO7Sb.0.5H2O (Sigma) were used to prepare 0.5 M stock solutions. Metalloid-containing medium was solidified with 20 g of Bacto-Agar (Difco Laboratories) per litre. The following degenerate pairs of 5 oligonucleotides were designed based on conserved regions of several prokaryotes arsenic resistance genes, arsB and arsC, available from public databases: forward primers 5'-GTG/CATC/TTGGCAA/GCCG/CAAA/GGG-3' and 5'ACG/CATC/TTAC/TCAC/TAAC/TCCG-3'; reverse primers 5'GTG/CGGCATA/GTTA/GTTCATA/GAT-3' and 5'TCGCCA/GTCC/TTCC/TTTG/CGTA/GAA-3', respectively. 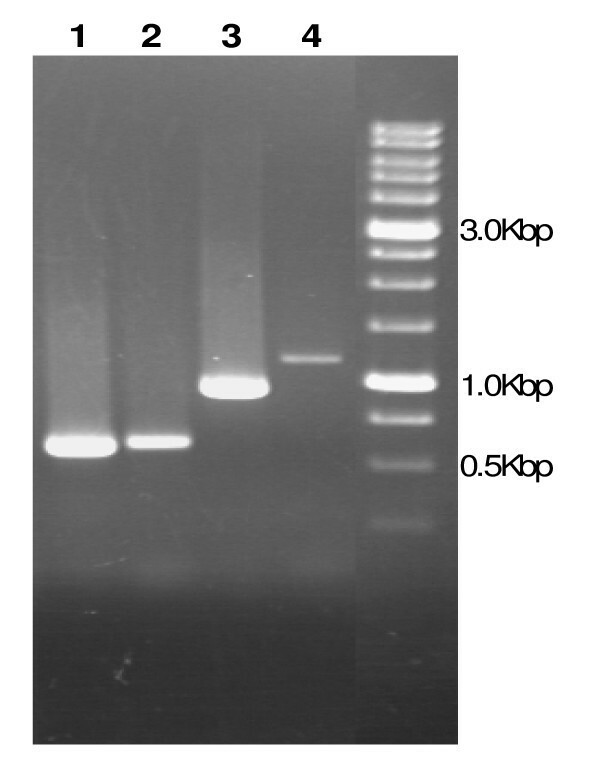 PCR fragments of 0.97 Kb for arsB gene and 0.35 Kb for arsC gene were amplified from O. tritici with these primers (purchased from Sigma Genosys). These fragments were subsequently used as probes for the isolation of the complete gene from the library. Total DNA was isolated from O. tritici as previously described . Two partial genomic libraries from this strain, containing DNA fragments selected by Southern blot analysis of genomic DNA with the 0.97 Kb and 0.35 Kb fragment probes, were obtained by complete digestion of total DNA with restriction enzyme Hind III (Roche Molecular Biochemicals), followed by ligation of purified fragments of around 5–9 Kb into the Hind III site of pUC18 (Invitrogen) and subsequent transformation of E. coli XL1-Blue with the ligation mixture. Clones were selected for their resistance and positive clones were confirmed by colony hybridization with a digoxigenin-labeled probe (Roche Molecular Biochemicals). Inserts of positive pUC18 clones and pGEM-T Easy (Promega) clones were sequenced by using vector-and insert-specific oligodeoxynucleotide primers. DNA sequencing was performed by using a BigDye Terminator v1.1 Cycle Sequencing Kit (Applied Biosystems) using a model ABI310 automatic DNA sequencer. Nucleic acid and protein sequence analyses were performed with BioEdit editor . Comparison searches were performed by using the BLAST program of the National Center for Biotechnology Information (NCBI). 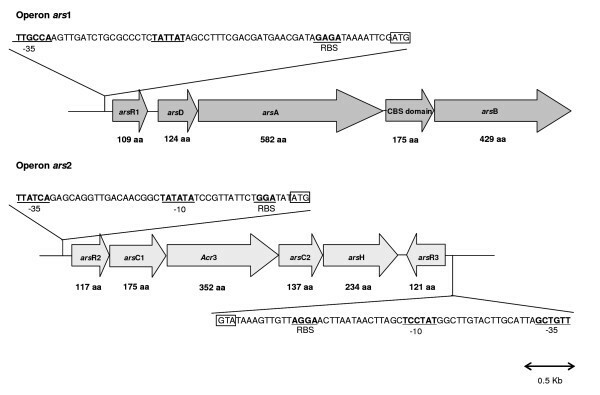 The ars genes were amplified by PCR using specific forward and reverse primers containing additional Xba I and Hind III recognition sites, respectively. The PCR products were purified after digestion with Xba I and Hind III and ligated into the corresponding sites into the pTRC 99A expression vector (Amersham Biosciences). Then, each construction was transformed into competent E. coli AW3110. Cells bearing each plasmid were grown at 37°C overnight in LB medium containing ampicillin. Overnight cultures were diluted 100-fold into fresh LB medium containing ampicillin alone or with arsenite, or with arsenate, or with antimonite. When the absorbance at 600 nm reached 0.8 to 1.0, 0.5 mM IPTG was added to the culture to induce gene expression, and cultivation was continued for 6 hours. Cells were pelleted by centrifugation and dissolved in a loading buffer for sodium dodecyl sulfate (SDS)-polyacrylamide gel electrophoresis (PAGE). Total proteins were analyzed on 12% – 15% polyacrylamide gels. Arsenite and antimonite resistance assays were carried out in LB medium, while for arsenate resistance, cells were grown in low phosphate medium. Overnight cultures were diluted 100-fold into fresh medium containing the ampicillin and different concentrations of arsenite, antimonite and arsenate. The bacterial suspensions were incubated at 37°C with shaking for 5 hours for experiments in LB medium or for 15 hours for assays performed in low phosphate medium and the absorbance at 600 nm was measured. Total RNA was obtained from mid exponential phase O. tritici cells grown in low-phosphate medium exposed for 2 h to 1 mM of arsenite, antimonite or arsenate. Control cells were not exposed to added compounds. Total RNA isolated from those cells by the Rneasy Mini kit (Qiagen), according to the manufacturer's instructions, was then digested with RQ1 Rnase-free DNase (Promega) to remove the residual DNA. cDNA synthesis was done with Sensiscript Reverse Transcriptase (Qiagen) according to the manufacturer's instructions. Briefly, the reverse primers from arsB and arsH genes were used to create the cDNA for each ars gene clusters. cDNAs were used as template for the second PCR amplification reaction. For monitoring the expression of ars 1, were used 5 μl of the RT reaction and specific primers designed to amplify a region spanning the junction of the different genes of operon ars 1 and operon ars 2. RT-PCR products were examined by 1% agarose gel electrophoresis. DNA contamination of the mRNA was determined by PCR using Taq polymerase without reverse transcriptase. Southern blot analysis was performed as described by Sambrook et al. . Purified DNAs (10 μg) of strains O. tritici SCII24, O. tritici 5bvl1, O. grignonense OgA9a, O. anthropi LMG 3331 and O. intermedium LMG 3301 were subjected to digestion with restriction enzymes and electrophoresed on agarose gel [0.8% (w/v)]. DNA was capillary transferred for approximately 16 h to a nylon membrane in 0.4N NaOH, 1 M NaCl buffer followed by neutralization. DNA probes for structural genes [arsA, cbs domain, arsB, arsC1, Acr3, arsC2 and arsH] were amplified by PCR using gene-specific primers, recovered from agarose gels and purified with Wizard SV Gel and PCR Clean-Up System (Promega). Each probe was labelled with dioxigenin-dUTP nonradioactive (Roche Molecular Biochemicals) and the subsequent pre-hybridization and hybridization with the membrane were performed at 45°C to 58°C using DIG High Prime DNA Labelling and Detection Starter Kit II, following the manufacturer's instructions. The membrane was washed twice with 2× SSC-0.1% SDS at room temperature and twice with 0.2× SSC-0.1% SDS for 15 min at 68°C by constant agitation. Membranes were autoradiographed after incubation at 37°C for 45 min. The nucleotide sequences of the DNA fragments containing the ars 1 operon and ars 2 operon have been submitted to GenBank under the accession no. DQ490089 and DQ490090, respectively. This research was founded by Fundação para a Ciência e Tecnologia (FCT), Portugal, under POCTI/AMB/60909/2004 project. Rita Branco was supported by a PhD grant from FCT. We thank Barry Rosen for providing the strain E. coli AW3110. RB performed all experiments, designed the study and participated in the writing of the manuscript. A–PC performed the gene sequencing. PVM coordinated the study, participated in its design and in the writing of the manuscript. All authors read and approved the final manuscript.